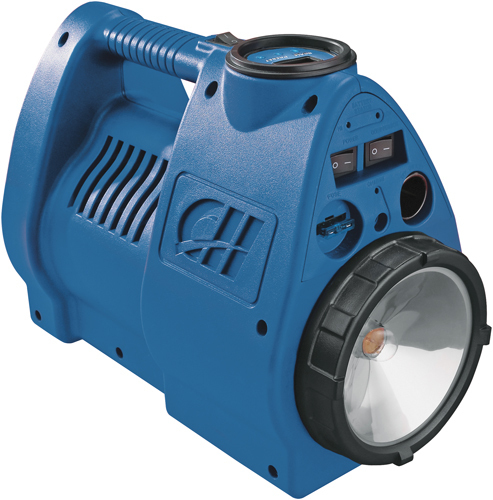 Unfortunately, the Campbell Hausfeld CC2400 12-Volt Cordless Inflator Worklight is no longer available. You can explore other items in the Air Compressor category yourself to try and find the perfect replacement for you! The Campbell Hausfeld CC2400 is a rechargeable and cordless 12 volt tire inflator / air compressor with 110 AC or 12-volt DC power recharging source. This very rugged and portable air inflator without a dangling power cord or long and unmanageable hose can be easily stored in any car trunk. Remember, with the CC2400 you will walk to each tire without dragging a long hose around and under you vehicle. This Campbell Hausfeld model CC2400 features a built-in gauge with automatic shutoff capability. Once you set the gauge by turning the dial to a desired pressure, The CC2400 shuts off when the set pressure has been reached. This automatic shut off capability is extremely useful for maintaining balanced air in the front or the rear tires. This small and portable air compressor is the ultimate tool for motorist and invaluable for safety during roadside emergencies. Very convenient to use at home for variety of fun application, to ensure balancing air in your tires, or to power/recharge most 12-volt electronic gadgets. The included 110-volt AC adapter as well as a 12-volt DC cigarette lighter cord allow the this tire inflator to be recharged at home AC outlet or through the car cigarette lighter when your are on the road and. Three additional inflation nozzles make applications such as inflation of an airbed, sports goods and party balloons quick and fun. Weight: 9 lbs Dimensions: 11.75" x 6" x 9"